(CNN) -- House Speaker Nancy Pelosi called President Bush "a total failure" on Thursday, among the California Democrat's harshest assessments to date of the president. House Speaker Nancy Pelosi says "I disapprove of Congress' performance in terms of ending the war." 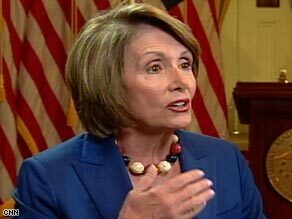 "God bless him, bless his heart, president of the United States -- a total failure, losing all credibility with the American people on the economy, on the war, on energy, you name the subject," Pelosi told CNN's Wolf Blitzer in an exclusive interview. The comments came two days after the president sharply criticized Congress over what he described as relative inaction over the course of the legislative term. At the White House on Wednesday, Bush noted that there were only 26 legislative days left in the fiscal year and said Congress would need to pass a spending bill every other day to "get their fundamental job done." In the interview, Pelosi said the president was in no position to criticize Congress and brushed aside the criticisms as "something to talk about because he has no ideas." "For him to be challenging Congress when we are trying to sweep up after his mess over and over and over again -- at the end of the day, Congress will have passed its responsibility to pass legislation," she said. iReport.com: Why isn't impeachment on the table? But Pelosi's comments come as a new Gallup poll registers the lowest level of congressional approval among Americans in the polling organization's 30-year history of conducting that survey. The House speaker said she doesn't consider those numbers a negative referendum on the Democrats in charge, saying she thinks they stem largely from Congress' failure to end the war in Iraq. "Everything I see says this is about ending the war -- 'I disapprove of Congress' performance in terms of ending the war,' " she said. "In the House, we, of course, have over and over, five or six times, sent to the Senate legislation for a time certain to reduce our deployment in Iraq and bring our troops home safely, honorably and soon. We haven't been able to get it past the Senate or the president of the United States. iReport.com: Why haven't Democrats done more? "So, on the basis of that, count me among the 70-some percent," she continued. "But that is one measure. The other measure that I'm more interested in is the one that talks about what is their view of Democrats. And the generic, who do you prefer to run the country on all of these issues? We're in double digits in any poll that you can take." Republican National Committee spokesman Alex Conant derided Pelosi's comments as "the sort of partisan politics that Democrats once decried and promised to change." "Rather than personally critique others, Speaker Pelosi should reconsider her own out-of-touch stance against oil exploration," he said. "With Americans paying record prices at the pump and Congress in gridlock, this is no time for the speaker to only offer personal attacks." In the wide-ranging interview, the entirety of which will air Sunday on CNN's "Late Edition with Wolf Blitzer," Pelosi also reiterated her longtime opposition to lifting a congressional ban on offshore drilling as well as opening up areas such as the Arctic National Wildlife Refuge in Alaska for oil exploration. Bush and congressional Republicans have pushed for those two policy changes. Pelosi has long opposed drilling offshore, a popular policy position among Californians, many of whom fear its environmental consequences along the state's coastline. But a recent CNN/Opinion Research Corp. poll showed that more than 73 percent of Americans polled approved of lifting the 1981 ban, and the move holds support among many in Pelosi's own party, whose constituents are growing increasingly angry over rising gas prices. Pelosi said the oil industry is not aggressively exploring large amounts of federal areas already leased to them and approved for drilling, including 33 million offshore acres and 68 million acres in the lower 48 states. She has sponsored legislation calling on oil companies to increase their production in those areas before they are allowed to go into the offshore areas currently banned. "Thirty-three million acres offshore are allowed for leasing," she said. "And we're saying to them, use it or lose it. You have the opportunity to drill there. When you have exhausted those remedies, then you can talk about something else." She's also calling on the president to release 10 percent of the more than 700 million barrels of oil housed in the country's Strategic Petroleum Reserve. Bush said Tuesday that he is against any release from the reserve, saying that stash is for emergencies only. He also disputed that it would have any effect on lowering gas prices. "What we are saying is, Mr. President, free our oil from the Strategic Petroleum Reserve," Pelosi said. "We're saying, let's take 10 percent of that, which has been paid for by the American taxpayer, and use that to put on the market so that we increase supply, reduce price." "And when the price comes down, we can buy back the oil at a lower price, put it in the SPR, use the spread for renewable energy resources." The House speaker has faced heavy criticism from House Republican leader John Boehner, who is leading a congressional delegation to ANWR this weekend and has said Pelosi's action does not adequately address the problem. He's also said Pelosi is leading the moderate faction of her party "off a cliff" by refusing to allow a vote in the House on offshore drilling. "Just because John Boehner, who is my friend, has my respect, says it doesn't make it so," she responded, reiterating that she will block any vote to allow lifting the ban.